Enter the rate you want the NPV Calculator to discount the entered cash flows. Note that the discount rate is also commonly referred to as the Cost of Capital. Enter as a percentage, but without the percent sign (for .06 or 6%, enter 6). Optional. If you would like the calculator to populate the Year column with the actual year labels, enter the 4-digit year of the initial outflow (capital outlay). Otherwise leave blank. Note that if you make changes to this field after creating and/or completing the cash flow entry form, the entry form will be cleared. So be sure you are happy with this entry before creating and completing the entry form. Enter the number of years you would like included in the outflow/inflow form. Optionally, if you entered a 4-digit start year you can enter the 4-digit end year. In either case, this is a required field. Note that if you make changes to this field after creating and/or completing the cash flow entry form, the entry form will be cleared. So feel free to enter more years than you think you might need as the calculator will simply ignore any extra blank years. If you entered a 4-digit year above, then this column will be automatically populated with the appropriate years based on the year entered in the line above. Enter the initial outflow amount on the first line (required) and then on any subsequent lines where additional amounts were invested (enter as positive values). Note that numbers entered in this column are usually entered as negative values when using an NPV spreadsheet function, however this NPV Calculator converts the values to negative for you. Enter cash inflows in the years they are projected to be received. You must have at least one value in this column for the NPV calculation to begin. The is the sum of all outflows less the sum of all inflows. This is the total number of cash flow years that were included in the calculations -- which includes the year of the initial cash outflow. This is the total of all discounted cash flows (NPV). If this result is positive, the project is considered to be desirable. If the NPV is a negative number, the project is considered to be undesirable. This calculator will help you to determine what net impact a prospective investment will have on future cash flows when accounting for the time value of money -- without having to deal with time-consuming present value tables. And not only will the calculator instantly calculate the net present value of a prospective investment, but it will also generate a discounted cash flows chart showing how it arrived at its answer. Plus, if you are doing sensitivity analysis (what-if scenarios), the calculator will provide you with a printer friendly report that you can print out and use for your comparisons. Enter the discount rate you want the calculator to use for discounting cash flows. If you want the entry form to include labels indicating specific years, enter the 4-digit starting year. Otherwise, if you want the labels to simply be year 1, 2, 3, etc., you can leave the starting year field blank. Enter the number of years you want to include in your discounted cash flows. Note that if you entered a 4-digit starting year, then you can either enter a number of years or the 4-digit ending year. Click the "Create Entry Form" button. This will generate a year-by-year entry form for entering all applicable cash outflows and inflows. Enter the starting cash outflow (investment) on the first line of the form and then enter all subsequent outflows and inflows in the years you expect them to occur. You can skip over any years where no cash flows occurred. Also, the calculator will interpret the last cash flow entered as the end of the report, regardless of how many years are included in the form. 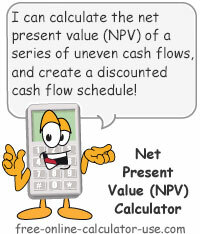 Once you are satisfied with your cash flow entries, click the "Calculate Net Present Value" button. This will display the present value of the discounted cash flows, along with a year-by-year chart showing the outflow, inflow, net cash flow, and discounted cash flow for each cash flow year. Net Present Value (NPV) and Discounted Cash Flow (DCF) method explained. The term NPV stands for Net Present Value, which is a Discounted Cash Flow (DCF) method used in forecasting the long run desirability of an investment (capital outlay). Specifically, net present value discounts all expected future cash flows to the present by an expected or minimum rate of return. This expected rate of return is known as the Discount Rate, or Cost of Capital. If the net present value of a prospective investment is a positive number, the investment is deemed to be desirable. On the other hand, if the net present value turns out to be a negative number, then the investment is deemed to be undesirable. Furthermore, net present value analysis can also be used to determine which of two or more alternative desirable investments is the most desirable. Think of discounting as the opposite of compounding. In compounding you take a present amount (principal) and compound the interest earnings into the future. Whereas discounting takes a future value and discounts it back to the present (principal). To illustrate the difference between compounding and discounting, if you were to invest $100 today in an investment that paid a 10% annual return, and you wanted to know how much your investment would be worth 1 year from now, you would compound the interest by multiplying the principal by 1 plus the rate (100 x 1.10 = $110). Conversely, if you wanted to know how much you would need to deposit today in order for your investment to grow to $110 in 1 year, you would discount the future value by dividing it by 1 plus the rate (110 ÷ 1.10 = $100). In the case of net present value analysis, the DCF method takes each future cash flow and reduces the amount by how much of that cash flow represents interest earned if its principal portion were invested at the time investment originated. Then, once all future cash flows have been discounted, to arrive at the net present value you then sum all discounted cash flows and subtract that amount from the original amount invested. Typically, when deciding what rate to use when discounting cash flows, the rate used is equal to the highest rate you know you could earn elsewhere. For example, if you know of two other alternative investments (A & B) and if you know with a fair amount of certainty that you could earn 6% in alternative A and alternative B would earn 5%, then use alternative A as the rate for discounting cash flows. Now, if you were unaware of the effects of the time value of money on my proposal, you might say, "Wow! I could earn $100 without doing anything? Here's the $1,000!" But this is where the importance of NPV comes to light. So is my hypothetical offer really something you should consider accepting? Well, that depends on what annual rate of return you could earn if you chose to turn down my offer and invest the $1,000 somewhere else. For example, using the net present value calculator, you will see that if you know you could earn a 5% annual return (entered as the discount rate) somewhere else, then taking me up on my offer will end up costing you $59.46 in interest earnings (the opportunity cost of giving me $1,000 today in exchange for my $1,100 in future payments, versus investing in a project offering a higher rate of return). On the other hand, if you knew the most you could earn on any other alternative investment was a 2% annual return, then accepting my offer would result in a gain of $31.49 over what you could have earned. By the way, if you wanted to find out the average rate of return of my hypothetical offer, you could use the IRR Calculator -- which uses a variation of the Discounted Cash Flow method for determining the internal rate of return from a series of cash flows. Plugging the above cash flows into the IRR Calculator will reveal that my offer would yield a 2.99% average annual rate of return.